I would like to preface this post by saying this one-handed-ponytail thing has gotten a lot bigger than I ever anticipated. Several weeks back, I received an email from a woman who is a certified hand therapist. That title, in and of itself, was certainly enough to peak my interest. 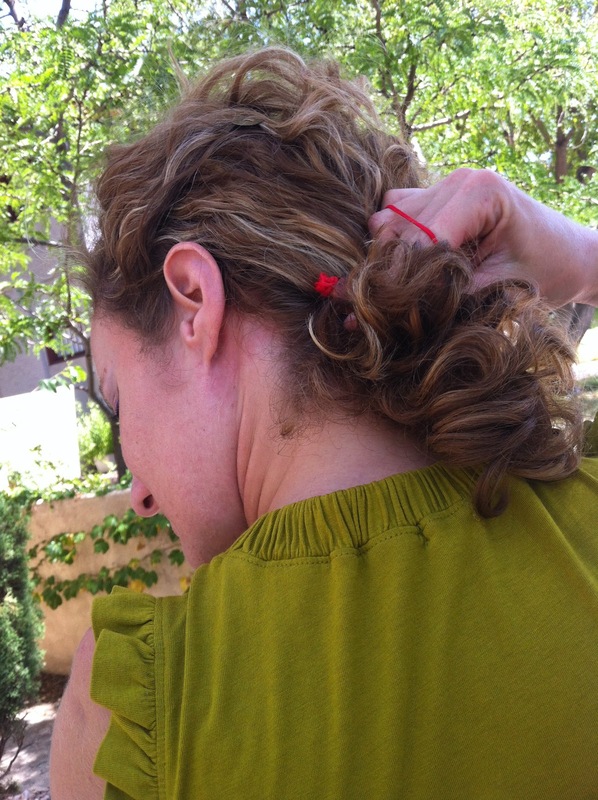 The hand therapist said she had created a one-handed-ponytail device and wondered if I wanted to try it out. Of course, I said yes, and several days later I found it in my mailbox. 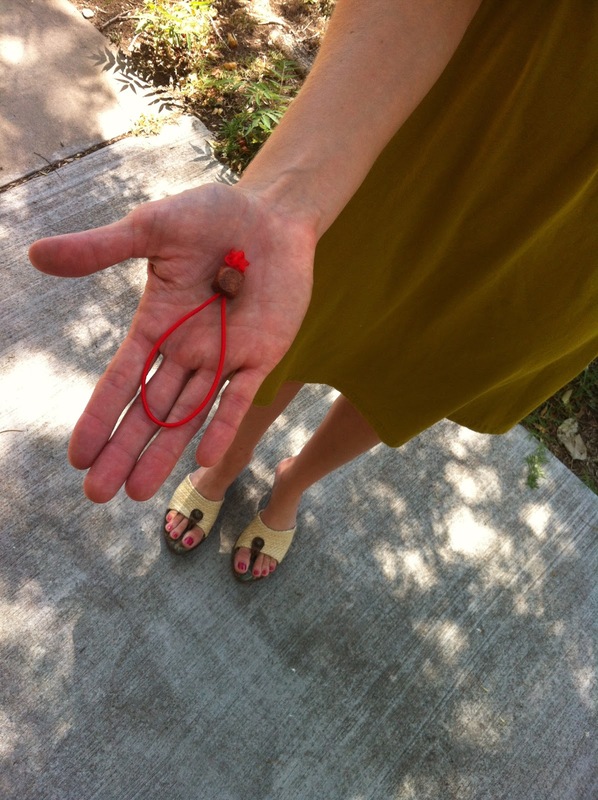 It is an elastic hair tie with a wooden bead strung on, knotted at the end to keep the bead from slipping off. After several practice runs on the yarn "hair" that was thoughtfully sent along in the package, I decided to give it a go. 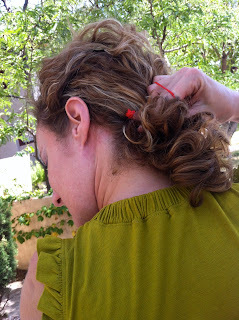 Step 1: With tie in hand, push wooden bead to knotted end and gather hair. 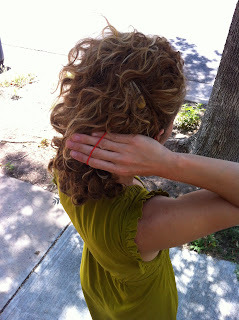 Step 2: Wrap hand around hair and pull hair through tie with thumb, holding tie in place with other fingers. Step 3: Push wooden bead with two fingers while resisting with thumb at knotted end of the elastic, thus cinching the tail. 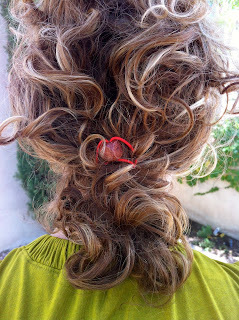 Firstly, I would like to say that, yes, I do always style my hair out-of-doors; I find it invigorating. Secondly, I would like to congratulate Sara, the hand therapist, on a very simple design. As you may imagine, this pony-tail-putter-upper can come in various colors and bead types, all easily packed up for on-the-go ponies. However, I can achieve nearly the same effect with the rubbery hair ties that I bought at Target, and with slightly less effort. That is not to deny that I could practice my technique a bit more, but I think some things need to be addressed. For example, gathering the hair (especially curly hair) with one hand is not easy to begin with, much less while trying to keep a hair tie from flying off your fingers. I also found it quite difficult to pull all of my hair through (granted, I have a lot of it) without losing the position of the elastic. And lastly, I was able to assemble a low pony, but it was difficult to move the pony higher without loosening the tail or creating bumps. My hair (though thick) is also very fine, so it slips easily. If you've completely lost me at this point, not to worry. I am aware this sort of thing is well beyond the average layperson pony-putter-upper's ability to process. Believe me, I could hardly understand the directions that came with the device. I've actually decided to submit this article to the International Limb Deficiency Cosmetology Journal. If only there were such a thing. But kudos to Sara the Hand Therapist for her design. You can check out her web site and order your own pony kit here. Yes, challenging instructions, challenging task, delightful presentation! I think you need to write this whole pony-tail research story into a magazine article. There's got to be a publication vehicle for this. Ha ha ha if anyone, you would know! Love it! And you have such gorgeous curly hair!